If you want to learn kanji while you learn how to read Japanese, please note that we have prepared a 550-page book titled Learn to Read in Japanese: A Japanese Reader. Students who use this book will learn to read 608 basic kanji, plus hiragana and katakana. It includes more than 4,200 authentic Japanese sentences and phrases for reading practice. In addition, in July of 2018 we released Learn to Read in Japanese, Volume II. This second book teaches 600 additional kanji, for a total of 1208. It includes more than 1,600 sentences for Japanese reading practice. In addition, It contains 2,900 vocabulary words and phrases for reading practice, most of which are associated with helpful mnemonics to help you to remember new terms. Please see this page for more information about Volume II. How can one Learn How to Read Japanese and Learn Kanji at the same time? To learn how to read Japanese is complicated. In order to get started, you will need to be able to recognize and pronounce 46 hiragana, 46 katakana, and hundreds of kanji characters. In addition, you will need to devote a number of hours to reading practice. If you want to learn how to read Japanese within a reasonable period of time (months rather than years), a good strategy is to learn hiragana, katakana and a number of basic kanji quickly (although imperfectly at first) and then start reading almost immediately. 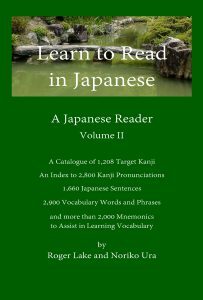 Our books make this possible by providing you with a large number of Japanese sentences written in a large clear font, easily accessible feedback on your reading accuracy, and a comprehensive Kanji Catalogue, including memory aides, to help you to learn a total of 1208 basic kanji as you read. Although it might seem somewhat impractical to start reading practice before you learn kanji very well, this approach is firmly grounded in a study technique known as Active Recall, which can be defined as “learning by answering questions.” Active Recall is the technique that underlies these Japanese Audio Flashcard Lessons, and it is also the basis of flashcard learning generally. In addition, the Pimsleur method and the “Learn in Your Car” method, both described here, are based on Active Recall. When you look at a Japanese word and try to read it unassisted, you are essentially asking yourself the question, “How is this word pronounced?” This simple question forces your brain to work to recall each character and its pronunciation. Since there is no penalty for incorrect answers and since the answers to the questions that you are asking yourself are readily available when you don’t know them, Active Recall is an enjoyable way to learn. When you are able to answer questions correctly, you will experience considerable satisfaction, and your sense of competence will be enhanced. Studies have shown that, in comparison to more passive study methods, Active Recall is highly effective for building strong memories. As you read the books, you will find that all of the help that you need to learn how to read Japanese is close at hand. If you relax and read the sentences at your own speed, you will be exposed to the same kanji repeatedly in different situations. By simply reading and availing yourself of the feedback and the references that the books provide, you will soon learn kanji and be able to read with confidence. Where can one Buy these Books that make it Possible to Learn How to Read Japanese? The books are available for purchase at Amazon, at Amazon UK, at Barnes and Noble, at the Book Depository in the UK, at Booktopia in Australia, at Amazon Japan, and at many other sites. Any bookstore can order them from Ingram Spark, one of our publishers. Please note that there are differences in the books’ sizes, depending on where you purchase them. The books that are sold at Barnes and Noble and other bookstores are about 0.4 cm thinner (2.8 vs. 3.2 cm) and 4 oz lighter (26 vs. 30 oz) compared to the ones sold at Amazon. Please see the photo below which shows two pairs of books. In each pair, the book on the left, which was sold by Barnes and Noble, is thinner and lighter than the book on the right, which was sold by Amazon. This difference in book size was a complete surprise to us, and it results from the fact that one of our publishers, Kindle Direct, which is owned by Amazon, uses thicker paper than our other publisher, Ingram Spark, does. We have not been able to get Kindle Direct to change the paper thickness. Where can one find reviews of Volume I in the Series that Teaches How to Learn Kanji as you read Japanese? You can read reviews of our first book that teaches how to learn kanji and how to read Japanese on Amazon US, Amazon UK, and Amazon Japan. In addition, there is a review on Tofugu.com (on the Tofugu web page, the review is the 4th item from the top). If you visit a large Japanese bookstore in Japan, you will see hundreds of English Readers designed for Japanese people to use to perfect their English skills, but where are the comparable Japanese Readers? They hardly exist. The reason, I think, is that a Japanese person learning English only needs to know 26 alphabetic characters, whereas English-speaking people learning how to read Japanese need to know far more. An ordinary Japanese Reader is far too difficult for English-speaking people who are trying to learn how to read Japanese. As a result, they are forced to learn kanji laboriously one by one and hope that someday they will accumulate enough knowledge to start some serious reading. This approach is hardly conducive to the development of reading fluency within a person’s liftetime. Even after learning a large number of kanji, students who try to read random Japanese text are likely to encounter many more kanji that they’ve never seen before, with no easy way to look them up. In some cases, Japanese publishers provide furigana (tiny hiragana characters above kanji that they consider more difficult), and these can be helpful if one doesn’t know the kanji at all. However, furigana are unhelpful if one is trying to read kanji that one half-knows, since they allow the brain to cheat, and thus they hinder the development of true reading fluency. It seems to me that the solution to this lack of Japanese Readers lies in books like the two described on this page, which only use kanji in the order that students have learned them. In addition, these books place supplemental text, i.e., romaji and translations, in a small font in a separate column on each page, close to the Japanese text but clearly separated from it. When a reader doesn’t want to see romaji equivalents and translations, he or she will find it easy to ignore them, but the supplemental text is readily accessible when needed. To see how the two columns of text actually look, please click this link: Sample Chapters 1-4. The Reader section of the first book is divided into 103 chapters, each one containing roughly 40 practice sentences and phrases. 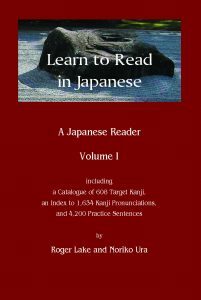 In the first 61 chapters, approximately 10 new kanji are introduced per chapter, and each kanji is used in 3 or more different practice sentences or phrases. In the last 42 chapters of the Reader in the first book, no more new kanji are introduced. Students can relax a bit as they practice reading the kanji that they have already learned. Since the Reader in the first book is partly based on the same collection of sentences that was used to create our Japanese Audio Flashcard lessons, students who have studied the lessons will find a great deal of familiar material as they read. Hearing, speaking and reading the same material will create a synergistic learning experience, enhancing these students’ confidence and morale. The books include informative Kanji Catalogues that describe “target” kanji — 608 in the first volume and 1208 in the second volume (Note: this second kanji catalogue includes all of the 608 kanji that are covered in the first kanji catalogue). In addition to showing pronunciations, meanings and examples of words that are spelled with each kanji, these Catalogues provide memorable descriptions of the kanji as images, focusing on their “radicals,” or subcomponents. Moreover, the Kanji Catalogues provide retrieval cues (or homophones) for all of the pronunciations associated with these 1208 kanji. Retrieval cues (also known as “cues”) are English, or sometimes Japanese, words that are pronounced in the same way that the kanji are pronounced. If you pay close attention to these three kinds of memory aides (kanji groups, descriptions and cues), you will find it relatively easy to learn kanji. To see a sample of the Kanji Catalogue from our first book, please click this link: Sample Kanji Catalogue. As you learn kanji and gradually learn how to read Japanese, you will want to refer frequently to the Kanji Pronunciation Indexes that list all of the pronunciations that are associated with the target kanji. When you encounter unfamiliar kanji as you read, you will be able to determine their pronunciations by referring to their romaji pronunciations in the adjacent romaji text. You can then look up those pronunciations in the Indexes and identify the kanji’s reference numbers, which can then be used in turn to locate the kanji in the Catalogues. To see a sample of the Index from our first book, please click this link: Sample Index. Please watch this video to see how to use the book “Learn to Read in Japanese, Volume I,” to learn how to read Japanese. The books are available as physical books and also for download as separate PDF files which can be used on electronic devices. Which format is best for you? The physical books have the advantages of speed and ease of use. It’s easy to open the Pronunciation Indexes at the backs of the books in order to look up kanji and then turn to the Kanji Catalogue to review the information contained there before returning to the text in the Japanese Reader. Using a physical book is a comfortable experience and feels more intuitive, compared to using an electronic screen. On the other hand, the PDF files have the following advantages: 1) The PDF’s are less expensive, costing $9 total per book, compared to about $24 for the physical book, and there are no shipping charges for them. 2) When viewing the PDF’s on your electronic device, you can easily resize the pages so that you see only the Japanese text. 3) If you are in Japan and need to refresh your memory about a kanji that you encounter, it’s convenient to be able to check the Index and Kanji Catalogue on a device in your pocket. 4) The PDF option can be equally fast, compared to using the physical book, if you are able to print the Kanji Catalogue and Index at home (see instructions below) while you use your electronic device to display the Japanese Reader. In order to use the PDF formats of the books to learn kanji and to learn how to read Japanese, use a PDF reader, such as the free Adobe Acrobat Reader app. This will allow you to keep all three PDF documents open at the same time, without losing your place in any of them. (Note: when installing Acrobat Reader, be careful to uncheck the three boxes on the screen that might force you to install other applications that you may not want.) For maximum convenience, you should create a single folder containing only these three PDF files and open it in the Acrobat Reader app. If you are using Acrobat Reader to read a sentence in a PDF file and you want to look up a kanji, first determine the kanji’s pronunciation by referring to its romaji equivalent on the right side of the page. For example, suppose that the kanji is 店. You will be able to determine from the romaji on the right side of of the page that this kanji is pronounced “mise.” Take a moment to remember what the kanji looks like, and then press the “Back” button in the upper left corner of the screen in the Acrobat Reader. If you have configured the Acrobat Reader as described above, you should now see the three PDF files for the “Learn to Read” book. Touch the “Index” file to open the Pronunciation Index, where you can locate “mise” and determine that its kanji reference number is 493. Again press the “Back” button to see the three PDF files, and this time open the Kanji Catalogue file. You can now quickly locate reference number 493 by using the slider on the right side of the screen. After you have examined the information about 店 that is contained in the Kanji Catalogue, press the “Back” button again and re-open the Japanese Reader file, where you will be able to continue reading from the point where you had stopped. If you are using the PDF files and want to be able to look up the kanji even more quickly, consider printing the Kanji Catalogue and the Index and binding them together for quick reference (see the photo below). All together the Catalogue and Index from the first book are 142 pages in length (71 pages if you print on both sides of the paper), and you can easily bind the pages together with an industrial stapler, or with clamps, or by drilling holes near the margins and tying them together with thread. (The comparable files from the second book are considerably longer — 238 pages, or 119 pages if you print on both sides of the paper.) After you print and bind the Catalogue and Index, you will be able read the Japanese Reader on your electronic device and quickly refer to the printed Index and Kanji Catalogue when you need more information about a kanji. In this photo, the Japanese Reader from Volume I is displayed on the screen of an iPad Mini. The Kanji Catalogue and Index have been printed on paper for ready access. When you print the PDF files, be sure to print them as “Actual Size” rather than using printing options like “Fit,” so that you will be able reduce their bulk later by cutting the pages down to a 6.5×9-inch format. Also be sure that your printer is not set to “Flip Pages Up” if you are printing on both sides of the pages. After printing (before binding) you can use a paper cutter to reduce the size of the pages. The following instructions apply only if you have printed the files on both sides of 8.5 x 11-inch paper, without flipping pages up: Remove 1 inch from the top margin, 1 inch from the left margin, 1 inch from the bottom margin, and 1 inch from the right margin. This will result in a document that is 6.5 inches wide and 9 inches high, with 0.5 inches of extra space on the left margin, which will give you room for binding. To buy the Japanese Reader PDF for Volume I, which includes the first 418 pages of the book, please click the “Shop now” link below. To buy the Kanji Catalogue and the Kanji Pronunciation Index PDF’s for Volume I, please click the “Shop now” link below. If you are planning to purchase both books, please be aware that the Kanji Catalogue and Pronunciation Index for Volume II contain all of the information that is contained in the Kanji Catalogue and Pronunciation Index for Volume I, plus information about 600 additional kanji. With that in mind, you should probably buy only the Catalogue and Index for Volume II. To buy the Japanese Reader PDF for Volume II, which includes the first 330 pages of the book, please click the “Shop now” link below. To buy the Kanji Catalogue and the Kanji Pronunciation Index PDF’s for Volume II, please click the “Shop now” link below. Note that these two documents contain all of the information for the kanji used in both books. To buy the physical book, please see one of these links: Amazon, Amazon UK, Barnes and Noble, the Book Depository in the UK, Booktopia in Australia, and Amazon Japan. Any bookstore can order the book from Ingram Spark, our publisher. To acquire the ability to learn kanji and other characters as they are actually written in Japan, we suggest that you spend some time writing them in accordance with their prescribed stroke orders. If you become familiar with stroke orders, you will be more likely to recognize the characters when they are written in non-standard fashion, as they often are in Japan. To see the prescribed stroke orders for hiragana, katakana, and the 608 kanji that we teach in the first book, please download and save the following files. You may wish to print these documents and refer to them when you practice writing these characters. If you have any questions or comments about the books, please write them in the box below. We will do our best to reply to every message that we receive, and we will post the ones that are of general interest on this page. If you would rather contact us privately, you may send an email to administrator@japaneseaudiolessons.com. Thank you for buying the two books. I hope that they will be helpful as you study Japanese. As I mention in the Preface to the first book, the 4,200 sentences in the first book overlap considerably with the 7,500 sentences in the audio lessons which you can download free of charge from JapaneseAudioLessons.com (go to Audio Lessons, Lesson Download Portal), but the order of the sentences is completely different. If you were to study the audio lessons and then read the book, you would find many familiar sentences in the book. The sentences in the second book were taken from the internet, for the most part, although many of them were derived from sentences in the audio lessons. Thank you for your encouragement. Yes, the second book is now available on Amazon Japan. Please try this link. We hope you like it. Let me thank you for this high quality material you made with the first book, I’m eager to start the other. Do you think btw that the first book is covering more less all Kanji needed for JLPT 3? I believe it is a match in term of number but it might be significantly different from the targeted kanji in the test. That’s an excellent question. I had not thought very deeply about how the two books might help people who are studying for the JLPT tests. After researching this today, I’ve come to the following tentative conclusions: The N5 test supposedly requires knowledge of 103 kanji and the N4 test requires knowledge of 181 kanj. All of these kanji are taught in Learn to Read in Japanese, Volume I. However, Volume I does not come close to teaching the kanji required for the N3 test. The N3 test requires 580 additional kanji. Volume II of Learn to Read in Japanese, which I am proofreading now and plan to release this summer, will teach 506 of those kanji. However, there are 74 additional kanji required for the test which Volume II will not teach. Therefore, I plan to make a list of those 74 additional kanji and post it on this web site after the book is released, so that students who are planning to take JLPT N3 will know which additional kanji they need to learn. Thank you for asking this question, as I think that this will help quite a few other students. I found your book interesting but I wonder if you’ll have the next level of it. I want to take JLPT N2 so I need books like yours. Yes, I’m working on Volume 2, in which I hope to teach another 600 kanji or so. I’m about half finished, but I really can’t predict when it might be ready for publication. Update April 1, 2018. The second book is finished, but I’m still proof-reading it. It will cover 600 additional kanji. I hope to publish it this summer. I have your 1st book. It was of great help-especially for non-schol types like me. I am eagerly waiting for the 2nd book. I bought the first book at Kinokuniya, in Shinjuku. Will the second be available there? Thanks for your message. I’m glad you liked the book. The second volume is finished. I’m excited about it, but there is quite a bit of proofreading and checking to do before I can publish it. It covers 600 more kanji in 75 chapters and is slightly longer than the first book. The book will present each new kanji in 5 stages: 1) the kanji catalogue, which also includes the 608 kanji from the first book, for a total of 1208; 2) the kanji pronunciation pre-test at the beginning of each new chapter (8 new kanji per chapter); 3) a chance to practice reading the new vocabulary words that appear in the kanji catalogue, the practice sentences and the supplemental reading material, with mnemonics to help you to remember each new word; 4) at least three practice sentences for each new kanji, separated from one another; and 5) optional supplemental reading material to practice reading the kanji in the context of authentic Japanese stories or articles (optional because you need to access paid content on the internet in order to read it, but reasonably inexpensive). I also have seen the book for sale at Kinokuniya in Shinjuku. We will try to make sure that they carry the second book as well. Thank you for your feedback, Catalina. We hope that the book will help you to start reading Japanese fluently. This format looks perfect. I’m wondering if the book is useful for beginner, intermediate, and advanced learners, or if it is catered more to a specific level. Thanks! I came across your website while I was looking for free Japanese online courses. I was fascinated by the approach you and Noriko took and immediately downloaded the first audio lesson. It is an amazingly helpful source, and I truly thank you for this generous offer. I will be purchasing your book as well because I truly trust in your content. I’ve studied Japanese for 3 years now at my university, finished both Genki 1 and 2. They are good books, but the exercises seemed to be dull sometimes. I believe that your approach is something that is missing in many classes in general: interactive learning. I sometimes really feel like giving up. All the hours I spent on the grammar sections, finding out that I still have difficulties in building sentences. Your lesson, however, gave me back confidence, and I realized that there is a lot knowledge in my head: I just have not been using it. Thank you so much, I gained back my power. It’s good to hear from you. Noriko and I really appreciate your support. I understand what you mean about having knowledge and not being able to use it. It’s a great feeling when we discover, as we pursue Active Recall learning, that we are able to answer a question correctly, uncovering otherwise hidden knowledge. This feeling makes learning exciting and gives us the encouragement we need to press on. I have the book and discovered the audio files via that. Just wanted to say thank you for the excellent material. It’s good to hear from you. We wish you all the best with your Japanese studies! Is there an ebook version available for this? Yes, in November 2017 we introduced a PDF version for immediate download.